When Truth Survives Free Speech New York Times. I’d refrained from posting on this situation precisely because it was hairy and the blogger did not seem to be the wronged party. Glad someone did the heavy lifting. Europe’s suicide pact MacroBusiness. Be sure to look at the table at the bottom. Italy Can Endure Rise in Borrowing Costs: BIS Bloomberg. Provided Unicredit does not fall over. And note the fact that the BIS adds a qualified “provided it retains access to the market.” That worry would have been deemed barmy a year ago. BIS report contradicts BoE easing estimates FT Alphaville (hat tip Philip Pilkington). QE skeptics will take note. US vacates Pakistan base amid drone debate Aljazeera (hat tip reader Richard Kline). This is a very big deal. Steve Keen: How He Saw “It” Coming, and Others Did Not INET. We posted the first segment of this interview. This entry was posted in Links on December 12, 2011 by Yves Smith. Corzine could always play the “Why pick on me?” card, if no other VIPs go to jail. Come to think of it, perhaps he could play another card – “If I go to jail, I’ll bring a lot of you down too”. How much does he know? On the other hand, maybe the guy is innocent: I mean, he’s a Democrat, isn’t he? Corzine as the bad CEO apple is at best media propaganda, a quick review of MF Global and its placement within the FED’s Primary Dealer Network paints a different picture. ron, this *qual-ity* of *borrowing* used to be called embezzlement (“I’ll just borrow this for a little while”). The financial sector had sold investors on margin usage while touting the safety of segregated accounts. The financial investment sector actors meanwhile have generated huge bonus along with inflated pay scales based on these credit driven operations. Skimming off percentages of these leveraged credit operations is the core of modern day brokerage operations while using the media to maintain the ruse that there accounts are segregated. did ftalphaville go behind a paywall? Get this–He’s talking about HUNGARY!!! In “The 1% Election”, Tom Engelhardt documents what must be a new record in “election”-year pay-to-play extortion. Obama is peddling influence at $35K per head! Guess I’ll sit this one out. At first, I was surprised that the bite on the American Jewish Congress (not to be confused with the US Congress) was so cheap, but then they’ve already bagged him, so I guess $10K a pop is overly generous. At that Congress, Engelhardt captures the hustler rhetorician’s most rousing line by far, rivaling Cain’s Pokémon: “No matter who we are, no matter where we come from, we’re one nation. We’re one people. And that’s what’s at stake in this election.” Little question which nation he refers and defers to. Good article, especially the spending. Taking his figures, prez campaign spending grew at 12% CAGR from 1976 to 2008–wow, that’s even higher than college tuition or health care. We’re not choosing a president. We’re determining electoral voters. The only “one man, one vote” for this election comes when the Electoral College votes. If you don’t live in a battleground state, the only visit and consideration you’ll get is if you’re at a fund raiser. Otherwise, YOU DON’T MATTER ONE BIT! It’s an election for _maybe_ one-third of the country. For the rest of us, it’s just a day to line up and pretend to be counted. It’s interesting about the electoral college and the popular vote. If 51% of us favor attacking the Grand Duchy of Fenwick and 49% favor defending it, it does not happen that 51% of our soliders attack him and 49% defend him. All 100% of our soldiers would attack him. If 51% of the voters vote for Ms. Jones and 49% vote for Mr. Smith in a state with 100 electoral votes (I am just illustrating a point here), all 100% of the 100 electoral voters of that state are for her. It’s not fair. But I see a similarity. Not only that, but a lof of things in life are like that. Doug, could it be the *nation of 1%*? Don’t you wonder why we can’t eliminate the *primaries*, just as easily as they were imposed upon the electorate for the benefit of the duopoly machine? I hope Tom will write about that. What is it going to take to send criminal enterprises Moody’s and Standard & Poor’s to the dust bin of history along with Arthur Andersen? DP, so much has changed since the *old days*, as is made clear by William K. Black, when he contrasts what he and others did in the 1980’s vs. what is not being done today. If no one is referring elite crimes to the Justice Department, and the Justice Department doesn’t want to look back, and the ratio of FBI operatives to criminals is drastically lower that it was in the 1980’s, is the “crimenegenic environment” of Wall Street + Gubmint likely to change? Looks like the only *remedy* is what We the People/Citizens will dare to provide. Lovely oxymoron in the ‘Europe’s suicide pact’ article — ‘expansionary fiscal contraction.’ Like unicorns and economic soft landings, ‘expansionary fiscal contractions’ are rarely seen in real life. “If the Southern [European] governments put money in their banks, their sovereign debt [totals] will go up, exacerbating their problems,” said Karel Lannoo, chief executive officer of the Centre for European Policy Studies in Brussels. Great non sequitur! If it’s a vicious cycle, then stabilizing the sovereign debt total only worsens the uncapitalized banks’ plight, and vice versa. But Lannoo’s defective logic perfectly captures the mentality on display at last week’s European summit. Surely there is some way to make two plus two equal five by executive decree! Here’s another article, from La Monde diplomatique, to go with the one’s already linked about Europe’s suicide pact. This fatal contradiction is built into the system. It cannot be addressed by the usual inflationary methods because the Europeans aren’t going to touch inflation with a 10 foot pole. It’s almost as if the world has now been advised that, because there is a 26-nation fiscal pact, the EU will come to the unavoidable conclusion that they must ultimately default on all the debt because they will not establish a supra-sovereign bank. Surely the Europeans know exactly what they have just done. I find it hard to believe that suicide is their goal. They are buying time, expensive time. To what end? From my corner seat as an ex-pat in Italy, I would say simply fear. Fear of the unknown. Fear of what the capitalist system and its imposed exponential extraction has effectively wrought. Fear of facing constituents who are seeing the downside rather than the upside of monetary union without political union. Fear that they (politicians used to dealing with more pedestrian sorts of local mafias and ‘gimme’ constituencies) have been blindsided and utterly outclassed by trans-national banksters. 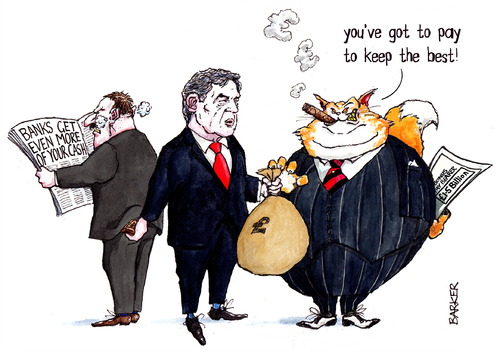 I can tell you that in Italy the same old factional multi-partite political distraction theatre reigns, and that no one seems to be referencing the larger issues of Goldman Sachs’ steering of national policy via Prodi/Draghi/Monti and the like over the last couple of decades. Perfectly intelligent people (scientists and international patent lawyers of my acquaintance) deny global warming and peak oil and willfully misunderstand the already-confirmed inexorable negative-growth trajectory that will define the rest of their lives and their children’s and grandchildren’s lives. It simply “does not compute”. But then, it doesn’t compute in America, either, so they can hardly be blamed. Susan, for time to extract the *cooperative community* from the maw of the *Anglo-Saxon* machine. Britain’s self-ostracism leaves the re-formed EuroCooperative to do what the British Empire has always dreaded and schemed against. Clearly, the Anglo-American Empire has gone too far. We the People/Citizens as a trading bloc would do best to become their legitimate trading partner of the SCO together with the EuroCooperative, shedding the Imperial *sole superpower* image as a snake sheds its useless skin, as we come to grips with stark reality and *move on* in C21. Perhaps the logic is not defective; the whole thing is one big mess. Sometimes the ability to admit we don’t have a practical solution (emphasis on ‘practical’) is greatly underappreciated. It’s rare to find a leader who can look beyond the lost war. To the European leaders, don’t take the Zone down with you. And stop this ‘The Zone doesn’t not deserve me’ thing. A “dilemma” is a situation which offers two solutions. This is the third-rail issue that no politico will touch: guaranteed negative growth and reduced living standards as far as the eye can see. Re: 29 trillion. In analogy to kiloWatt-hours, I propose a measure of “dollar days”. Given that interest is generated of savings times days, it would be a good way to measure the area under the Fed’s lending curve, and make quite intuitive just how the past 23 years differed from regular liquidity lending. Trivially speaking, if I personally were able to borrow a billion dollars at zero interest, it would take little for me to prove the market distortions this type of lending creates. I have posted previously about measuring economic pain in a similar fashion. Integrate pain of the moment (delta pain) over a period of time. Sometimes, short, sharp pain is preferred over chronic, long lasting, low level pain. I want to see a monetary system based on calories/Joules/Watts or similar. It would be mentally bracing if nothing else. Lidia, brilliant suggestion Will INET take this seriously? although 1 barrel is about 1.7 MWh, 1 MWh costs about $100 here in WA. MWh would work too. 3 years. Or maybe not. Re: Cassandra and Taxing the Dead. I have occasionally offered the following, Unobamiam “Grand Bargain”: you get your flat tax on all income, in exchange for 100% inheritance tax on everything above a threshold defined by 30 years of minimum wage earnings, per beneficiary. I would dedicate the revenue from this tax to free education gated only by aptitude. The initial “windfall” could be used for public infrastructure – free wired and wireless communication, improved powergrid and public transportation, continental rail – whatever lowers the threshold of entry for self-employment and pervasive commerce. If the supporters of inbred wealth really believed in the merit of merit, then they could not possibly object against a leveled playing field. Thanks for the comment as it is good to see folks at least discussing this issue. While your suggestion has merit I wonder about the “…per beneficiary.” part and potentially see a lot of late life children for successful folks…..the poor wife. The tax is a great idea. I would, though, just divide the tax revenue equally among all American and refund the money. I don’t think the government should decide how to spend that. Trust the people to spend the money. This principle can also be applied to, say, traffic tickets, penalties on Goldman (a dream, I know), profits on TARP loans, etc. b. *100%* – that’s the immediate cure. The rest would be up for grabs. Obama says the things that happened that caused the financial crisis weren’t illegal. That’s why he couldn’t prosecute. What a load of BS. Oh my god, read some of the comments on this Dealbook piece. Comment #13: “Sometimes I wish Obama *were* king. He’s intelligent and thoughtful, and on the right side of a lot of issues. But we live in a democracy, and he’s not king — only president. I think a lot of people expected him to act like a king, and magically change the world with his Might King Hands, closing Guantanamo and switching to single-payer health with no help from congress. Unfortunately for them, any change to the law has to go through congress — and about half of congress has dedicated their life to first and foremost to stopping him from doing anything, ever. “Obama is a liar. There are many, many examples of activities that went on that were illegal. For one obvious example, Lehman brothers was engaged in accounting chicanery right before it went belly up. Repo 105, as it was known, was an accounting trick that classified a short term loan as a sale in order to reduce the reported leverage of the firm on its disclosed financial statements each quarter. Comment #13: [Obama’s] intelligent and thoughtful, and on the right side of a lot of issues. But we live in a democracy, and he’s not king — only president. Right. Wrong. Wrong. Wrong. Right. Two out of five. Not bad for a NYT reader. tom allen, Obama accepts the laws created by Wall Street as *The Law* — I guess this is what he learned at YALE. Sorry, I mean *at Harvard*, YALE Law goes with *Clinton*. Property records are a bit vague so we can’t accurately discern what amount Mister and Missus Mozilo paid for the Thousand Oaks mansion they now have on the market but the deeds and docs we peeped online reveal the long-married couple picked the place up in March of 2000 with a $700,000 mortgage. Redfin shows Mister and Missus Mozilo first pushed their red-brick, center-hall Georgian-Colonial-style (mc)mansion in Thousand Oaks on the market in late July (2011) with an asking price of $3,680,000. In mid-October the price was reduced to its current $3,400,000. It’s deflation for the 1% and inflation for the 99%, as they continue to fight deflation. Oh, it’s *trickle-down*–the hoipoloi house went from $50K up to %150K, so it could be used as an ATM machine, with help from *Countrywide* bucket shops. I read recently that London if fine with bucket shops. On the Steve Keen INET Interview. It ends with Keen explaining that his present research is working on a monetary-economic model that includes the inter-party transactional monetary modeling, esp that of the central bank. Dr. Keen has already seen such a model. He was present at the American Monetary Conference last year when Dr. Kaoru Yamaguchi presented his model of open macro-economics. At the time, Dr. keen opined it was the most sophisticated macro monetary-economic model he had seen. Dr. Yamaguchi’s model predicts the outcome of financial insolvency for the MONEY system, and found that only through recourse to non-debt based public money could there be a sustainable monetary economy. His work is very much consistent with the ideas of Frederick Soddy, author of The Role of Money. joebhed, thanks for the link to the Yamaguchi paper, certainly to be studied. What bothers me is the form of *monetary standard* that is MISSING under “A Systemic Failure of Debt Money” on p. 8. He cites: “Gold Standard Failed (1930s); “Gold-Dollar Standard Failed (1971); and “Dollar Standard Collapsing (2010s?)”. This last category should mention the “Petro-Dollar Standard” forced on the world by certain parties, followed by the “Extraction-from-Spreads-Dollar Standard” (2010s?). Since this makes me suspicious about the *unknown knowns and unknowns* that may be lurking behind the curtain, especially considering that THIS PAPER “With a modest REVISION [?caps mine] was presented at the monetary reform conf. in Chicago, organized by the American Monetary Institute, on Oct. 1, 2010.” Note that THIS PAPER was presented at the 29th International Conference of the System Dynamics Society, Washington, D.C., USA, July 25, 2011. Yes, these dates are exact. Nevertheless, the System Dynamics approach, and the renewed attention to *flow* in light of the intractability of our current dead end within the frame of Mandelbrodt’s insights which more recently have that received renewed attention, is welcome. My Reply to a comment here today asks that INET take seriously the notion that “calories”–actually a “caloric system” of evaluation–might bring order to a fluid dynamics conception of a *monetary system management*. This might be a very useful way to imagine *heating*, *cooling*, *expansion*, *contraction*, *stasis*, and *exchange*. Why not? Is INET open to suggestions from the floor? Hasn’t it been proposed that a way of educating *the public* about *economics* should be a worthy goal of INET? Surely, in an *open democracy/open system*, entrenched Academics must not be the only ones given authority. Aren’t we *all in this together*? What is *participatory democracy* for? “A Century of War: Anglo-American Oil Politics and the New World Order” – New Edition (2011) by F. William Engdahl. In addition to his own book “Debt: the First 5000 Years”, anyone who was interested by his comments about Malagasy and “ethnic identities” that are actually socially movements that succeeded may find the book “The Art of Being Ungoverned” of interest. The article “Europe’s suicide pact” is a good article. Like so many analyses though it avoids ascribing the persistence to failed policies to kleptocracy. There was this Freudian slip however: “Europe is now in an ideological vice.” A vice is an immoral proclivity while a vise is a kind of clamp. But it is actually more even than a vice. It is a clear-eyed plan to loot. Kleptocracy supplies the reason why European leaders make the choices they do and for whose benefit, and it makes clear that this is not a suicide but a homicide. Re Randy Wray’s post, the number I use for the Fed special programs is the activity that occurred in them as per the appendices in the GAO report, that is $28.2 trillion. It would interesting to know but is ultimately immaterial how much of this represents rolled over loans. That loans were rolled over simply indicates that as well as being massive the Fed interventions also needed to be sustained. Maybe the author used ‘ideological vice’ deliberately, referring pejoratively to Austerianism. For the *Junker” rentier class (likely since Charlemagne), see “CONJURING HITLER” by Guido Giacomo Preparata, with special reference to Thorstein Veblen’s insights. Well, I just landed on a very pleasant surprise! On this episode of Greedy Bastards Antidote, we’re covering a new term from our upcoming book. This week, we’re focusing on extractionism. Joining us to discuss it is Yves Smith of nakedcapitalism.com. She is author of ECONned: How Unenlightened Self Interest Undermined Democracy and Corrupted Capitalism. reader, it’s all *extraction capitalism* all the time. The most recent full description is in “The Shock Doctrine” by Naomi Klein, to be compared with “Hitler’s Beneficiaries” by Gotz Aly (extraction capitalism, through Lebensraum: Financial Lebensraum by Bosses of Reich IV, as refinement of the Military Lebensraum of the Bosses of Reich III). The 1% DNA is eternal, with re-combinant DNA from era to era. “CONJURING HITLER” by G.G. Preparata may be the connecting link between studies by Aly and Klein. Extraction capitalism = investment banking. You invest, they extract. Speaking of which, find a recent discussion of the Cooperman Letter. Don’t touch my junk. Hmm….as I sip my espresso, let’s have a look at today’s news. Rising fear of job loss for the 99 percent. check. Question: who took $586 billion in Fed swaps? Now on to important matters: What should I have for dinner, and where? I was thinking Roast Duck, but where? Arthur Schwartz says that 4 Seasons has the best roast duck in NYC. But Howard (Milstein) swears by the Roast Duck Magret’s at Le Bernadin’s. The thing about the 1% is that someone would always want to be the king of kings, that is, the 1% of the 1%. Oh, Lloyd, what can I do to pleez U? I didn’t know Goldman Sachs was into shipping too. Apparently they own SSA Marine. LOL! They’re everywhere. It looks like Oakland, Portland and Seattle have been successful but not LA and San Diego. OWS has a good live video stream. I think the camera operator is one guy who calls himself “OakFoSho”. He likes following the police around. EmilanoZ, search “Marine/Maritime Law” on YouTube–the source of the Power putsch since “The East India Company” and “The Opium Wars” from Russell through Bush Dynasty. Only in USA can CEOs get away claiming “innocence” about company malpractices while teachers are subject to “no excuses” accountability and held responsible for the test scores of their students. And this when teachers have no control over their inputs – resources allocation or the ability of kids. I wonder if she can answer my question from a week or so back – what to do with those prime real estate properties known as cemetaries? Can the dead legally own plots in them? I think the horse’s strength lies in its hair. As you probably know, the super strong draft horses (Percherons and Cyldsdales) have hair just above their hooves, as this one does. He looks a little too finely boned to be a draft horse, but maybe he is a young’un. Yves, I didn’t know about the Percheron. I hope they don’t call this young’un Samson. This looks to me like a Friesian. My DH and I, on a lark, took a driving lesson with Friesians while visiting Vermont on vacation. They put their prize stallion Othello through his moves for us and even as complete know-nothings it was obvious we were in the presence of something special.. out of this world, almost an alien species of horse at that level, a body that was enormously powerful and panther-like, yet precise and under (the owners’) control. The breed apparently has a very good temperament and, while showy, has been widely used as resistent and intelligent work/draft horses in their native Netherlands. In fact, according to DH, in the Italian language an alternate word for “sawhorses” (other than cavalletti, “little horses”) is “Friesiani”. Is that horse jumping off a cliff? Uncomfortable Jungian dream associations come to mind. This is not an antidote. It’s the disease, like the beautiful graphical abstractions of a deadly virus seen under a microscope. Yes, it is! See Wikipedia for more info on the breed. I was just about to comment, but you beat me to it. 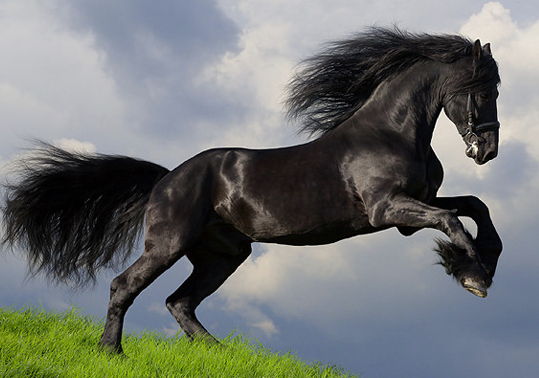 Friesian horses are magnificent. Hope I didn’t step on your toes; I had not read down to your comment before offering mine. I loved the horses, but to me they are a little eerie because their eyes are totally jet black, as are their coats and lashes in most cases, so they seem almost “unseeing”. There are two of these in Walla Walla and we get to see them every year at the Mares & Music program. They are beautiful! After looking at that horse picture, and reading all these horse comments, I’m no longer in the mood for duck. What I’d really like for dinner now is raw horse meat. I order this whenever I’m in Europe or Japan, and I find it has a sweet taste (especially the meat from younger horses), reminescent of eating beef and venison together. They call raw horse meat Basashi in Japan, and you can find it anywhere, but unfortunately this is not the case in New York City restaurants, especially on short notice. So I’m settling for the $5,000 Fleur Burger, by Fleur de Lys chef Hubert Keller. This burger contains kobe beef, truffles and foie gras, and comes with a bottle of 1995 Chateau Petrus from Bordeaux. Lloyd, do they serve fries with that? The Fleur Burger comes with fries, and you even get a certificate proving you ate a $5,000 burger, just in case no one believes you. But responding to Andy above, concerning a clear conscience…..
Last week, seeing Jon Corzine still at large, I decided it was time to re-hypothecate all the non-margined cash held by customers of my firm. I moved it to offshore accounts in my name in the Caymans, Nevins and Belize. Under Reg T, they gave me the legal right to move their money to offshore accounts. No one forced them to do that. The re-hypothecation business has been good to me, so far. I’m looking into the rehypothecation business as well, and was curious as to how much equity, if any, are you allowing to show up in the accounts of actual looted customers? And more importantly, are you letting those customers access any of that money or transfer a certain percentage of it to other firms? In other words, how do you keep the looted customers from seeing through the charade, and then spreading panic to the non-looted customers, or those accounts that have yet to be looted? It seems clear now that the goal of every banker worthy of the name should be to re-hypothecate as many accounts as possible before this MF Global thing leads to a systemic-loss-of-confidence event. Lloyd, to think that in the 1930’s gangsters used to light up their cigars with *C-notes*–how quaint. I’m glad you don’t just burn up money like that, I mean you DO get *value* with that $5K Fleurburger with frittes. But wait, you clever so-and-so, are you also *creating capital* on the spread between Kobe on the hook and Fleur on the plate? A little side bet nobody knows about but you and your friendly M.C.? Dear Lloyd: Please be cautious with the horse meat. Some suppliers sell the meat of former race-horses, and as you probably know they are fed a diet heavy on performance-enhancing supplements and drugs. You’ll know you’ve dined on the meat of one of these horses when afterwards you develop an overwhelming desire to enter yourself in the Kentucky Derby. ANTI-DOTE: After onset of symptom, call Willie Shoemaker. Have him hop on your back and then run a mile-and-a-quarter in two minutes. Your desire to run in the Derby will be replaced by an overwhelming but not unpleasant exhaustion, and an aversion to further consumption of horse-meat. So Sherrod Brown and the too-lazy-to-meet-new-constituents Barney Frank think that we dont need to know who fed at the 600 billion dollar swap trough. I guarantee you that US Banksters were using that backdoor financing to further conceal their ludicrous financial engineering horseshit. These people and their two Democratic Congressional whores deserve their own circle of Hell if only Dante could stomach the prospect of writing about them and their galling hubris and hypocrisy. TB, JD – a thought: maybe the payola to the MC consists of the *created capital* from every 100th arbitrage. That way, all profits are tied together in a co-dependent loop. (Reuters) – Up to a fifth of patients being treated for depression with some medications may do worse than those given a placebo, according to a U.S. study. Now for the comment: Think of that ‘cash on the sidelines’ in the context of the current re-hypothecation scandal. Imagine if some of what appears to an outsider to be cash on the sidelines is actually assets that have been rehypothecated to the point where they’ve become unmovable. Even if the nominal owner wanted to move the funds, because of unbeknownst liens, the asset cannot be moved until other [bank discretionary] actions have concluded. Let that sink in… it’s not hypothetical.